Unless you're totally clueless, you know that leaving your suitcase unattended for any amount of time in an airport is a really, really bad idea. If someone gets weirded out, you're suddenly the reason why an entire terminal has to be evacuated. Or, worse, the cops swarm and decide to detonate it out of an abundance of caution, and the roller bag of coconuts you've been toting around is suddenly blown to smithereens. An absentminded passenger learned that the hard way earlier this week in Italy. 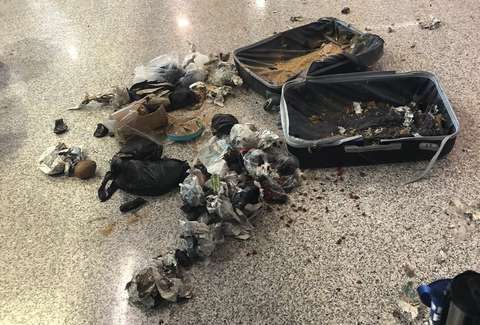 At Rome's Leonardo da Vinci–Fiumicino Airport on Tuesday, a suspicious bag left unattended in Terminal 3 created quite the commotion, when police descended on the area to scope things out. Unsure of the suitcase's owner and intent on determining what was inside, the authorities told people nearby to clear out so they could further investigate. Then, presuming it was a bomb for some reason, they actually went ahead and blew the bag up right there in front of everyone, only to discover the the contents in question: a bunch of coconuts. Ned Donovan, a freelance journalist who happened to be at the airport at the time, managed to capture the scene in a few photos and shared them on Twitter along with some commentary on the whole situation. He alluded to the questionable safety of detonating something that was presumed to be an explosive with so many people close by, and the authorities' subsequent blasé attitude in the aftermath. Another bystander present during the brouhaha took to Twitter to confirm how chill everyone seemed to be acting in light of what could have been a pretty dangerous situation. According to Donovan, police ended up searching the bag's supposed owner afterwards, though it's unclear whether that person was charged with any crime. What is certain, however, is that they're now missing a some crucial ingredients to make pina coladas.